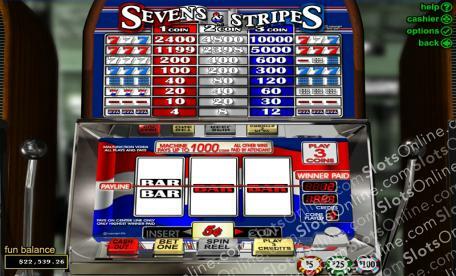 If you're looking for tradition when it comes to slots, there's little out there that is more traditional than winning a load of cash by scoring lucky sevens across a single pay line on a 3 reel machine that features a patriotic theme. Click here to play! If you want to uphold your patriotic duty, score a red, white, and blue seven across the pay line to take home up to 10000 coins! Three red lucky sevens will pay out up to 5000 coins, and three white lucky sevens will get you up to 600 coins. Red, white and blue Bars are also big winners with several different combinations of single and double Bars bringing in a decent amount as well. So, salute your country's colors by playing one of the most traditional of casino games. Spin red, white and blue tonight to win a massive fortune!